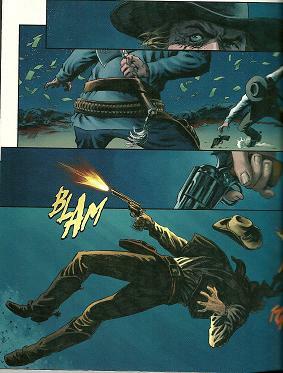 Face Full of Violence is 144 pages and covers Jonah Hex 1-6. The art is done by Luke Ross and Tony DiZuniga. The pictures I’ve included from the book are all from the first issue and done by Luke Ross. 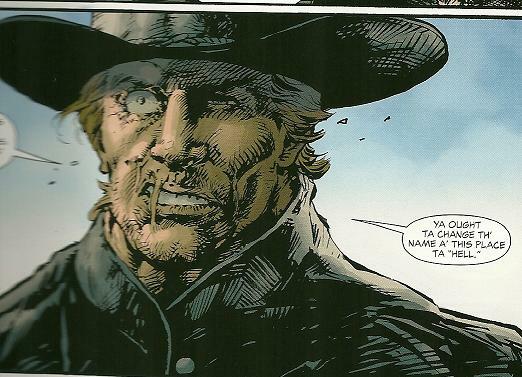 You can see how photo-realistic his art style is and how Hex bears an uncanny resemblance to a Man with No Name. Probably the only thing I don’t like about the re-launch. I just don’t care for the artists that make Hex look a little too much like Eastwood. The book is wonderfully written. Much like in the older stories, Hex is surrounded by a corrupt and immoral old west. Under his scars and six guns he is still more compassionate then almost every other character he runs into. When crossed or threatened the guns come out and Jonah will do anything it takes to survive. Palmiotti and Grey get it. 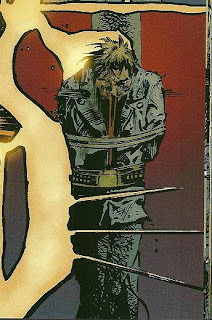 They understand who Jonah Hex is and put him through his paces. It is refreshing to see such care taken with a character. 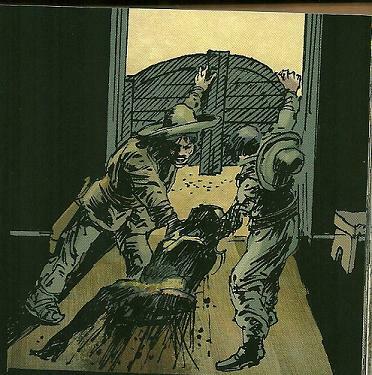 Western comics are past their glory days, but the Hex comic is still going. But it could still use your help. Face Full of Violence is a wonderful primer to the great stories that are being put out every month. Jonah hasn’t been without guest stars either. 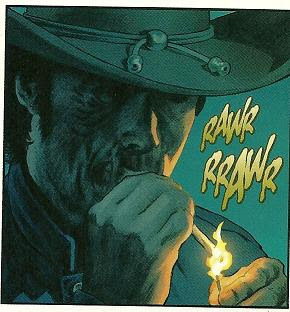 Palmiotti and Grey have even dusted off other western characters like El Diablo and Bat Lash. Holy crap do they make Bat Lash awesome. His appearances are seriously worth tracking down. Released just in time for the movie, No Way Back is an original story released directly into the graphic novel market. It is a hard covered and that runs 136 pages. Grey and Palmiotti are back on as the writers and Tony DiZuniga is back on artistic duties. DiZungia’s art is much scratchier then in the first Hex tales, but it almost makes it feel dirtier. The book looks fantastic. The story goes back and shows some untold history of Jonah and the reoccurring enemy El Papagayo. Considering it is a comic book, this had the potential to be a really cheesy story. I won’t go into the details but Hex and El Papagayo aren’t long lost twin brothers. There is no giant “everything I thought I knew is a lie” twist, it makes sense. Also they keep the story grounded in plausible reality, just because the movie might have some fantastical or supernatural elements, they thankfully aren’t here. I’m including the picture below just because I love it so much. DiZuniga is a master of the art. I can’t recommend these books enough. If you’ve never read any Jonah Hex books you are in luck. The first issue of Grey and Palmiotti’s series has been reprinted and you can pick it up at a comic shop for a dollar. If you like it, pick up Face Full of Violence. I’d recommend No Way Out to those who already know a little about the character, just because it is hard cover and carries a little bit bigger price tag. I’m set to see an early showing of the movie on Monday. So my last Hex article will probably be on Tuesday with my reactions. I wish they would have let Grey and Palmiotti write the script, but I’m trying to go in with an open mind. Regardless of how the movie is, hopefully you’ll check out one of the Jonah Hex books. You won’t be disappointed.